@Slepalex - I love the terrain you made with the stairs. I made several tries and was unable to get the brushes to work last night. Not sure why the terrain editor is freezing up on me. I may have to reload my iMac and use it exclusively for Bryce--keep it as my retro "way back machine". It seems with every new update on the Windows 10 platform there are more issues. Bryce crashes a lot on me which is one reason I was looking for an alternateive. Also, thanks for the link to TerraBrush. I can't wait to try this out. I played a little with WC1 which is much like GeoControl. I could never find a set of tutorials or an official user guide for WC1 or GeoControl. Throw in the trash Win 10 and go to Win 7. Slepalex, I am not following the TE quite well ... I completely forgot how it work. If I press 'raise/lower' under the evaluation menu, the image disappears in terrain canvas and 3d preview turns black How do I Iower the very thick model as seen in the 3d preview? ARRG..criminy. I just built my computer in summer of 2016.. yup.. its time to build a dedicated retro beast .-redo my MAC and a dedicated retro windows machine--and leave them offline .. yes, I agree.. I have a copy of Win 7 pro..so I can go back to that...I think they stopped support for Windows 7 as they made us upgrade at work. .I made the fatal mistake of upgrading my iMac after I built my windows machine... to El Capitan (it came with OS X 10.5 Leopard) and ran Bryce perfectly..so the new versions of Mac OS will not run Bryce or programs similar. .Leopard was the last release to have support for PowerPC type programs.. found that out after I upgraded... I hear Apple is ceasing support for older OS as well.. .
Go back to the main window and make the terrain thickness of 0.001 or as you need. Then assign the same texture to this terrain. Laura: I'll try to upload these two pics so you should be able to have a go with them yourself. I drew the roads as greyscale for the TE and then also did a colour version to use as the diffuse channel... It only took about 20 minutes... So isn't perfect, but it shows what can be done. Made idealy for 2048 resolution terrain. Eugenius Maximus, could you rename this thread, for example, in the Terrain Editor and the height map generators for Bryce? This title is most relevant to this topic. If you can not, then you need to contact the administrator. Dave - also good examples, the steps look great. I also experimented a bit. First pixelisation, then Posterisation then Subcontours. Do you know that you can pixelize with posterize if you hold down the Alt (or Cmd on the Mac I think) key? Subcontours create the dark lines. 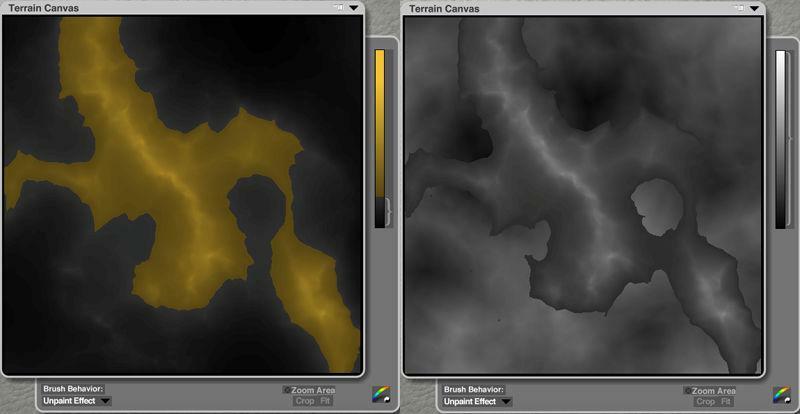 The grey terrain is the one at left, the right shows the three darker ones and what I made from it. Dave Savage - Thank you for your time to create those road terrains. This is much appreciated. Will try it out. Horo, great job! Thanks for Alt + posterize. I just never did it. If I press 'raise/lower' under the evaluation menu, the image disappears in terrain canvas and 3d preview turns black How do I Iower the very thick model as seen in the 3d preview? Press and hold the button down while moving the mouse left and right. That should do it gradually. Great, Horo...so simple (no offence)...would stacking (double/triple) be possible/applicable also here to like you done in terrains? If so, different sky-scrape mat-stacks would be interesting, thus, producing a more varied sky-scape scene. Nice, Slepalex...I suppose adjustments in the DTE would be a play-around-experience. PS. sorry to all for my ignorence: I have played around with the DTE once, but abandoned it simply that it just took too long-a-time to ignore (life is short etc., and please don't see this as criticism to you experimentors out there, it's just that other areas of work took precedance). Slepalex - Thanks for the Terrabrush; I've been trying so many terrain and height maps generators lately that my head has been spinning, so it might be a while until I try it. Nice cityscape. StuartB - Thanks for TerraBrush's direct link and helping with the Language settings. Rasberri - Nice posterized terrains; well done. Horo - Very Cool! I had no idea that you could use the Alt Key in the Posterize. Thanks for the tip. This terrain was originally a 12 Tile Lava landscape I had created last night. Thanks to Horo's Pixelization, Posterisation, and Subcontours process, it was converted to a more interesting landscape. Black Onyx texture was added. Slepalex - thank you. Bryce is full of surprises. Jamahoney - yes, simple. Stacking needs to be experimented with, it did cross my mind. Rasberri - nice experiments. I found that using pixelisation before posterisation gives the better result in many cases. Eugenius - the first terrain is very nice and the second has added details. Cool renders, both. 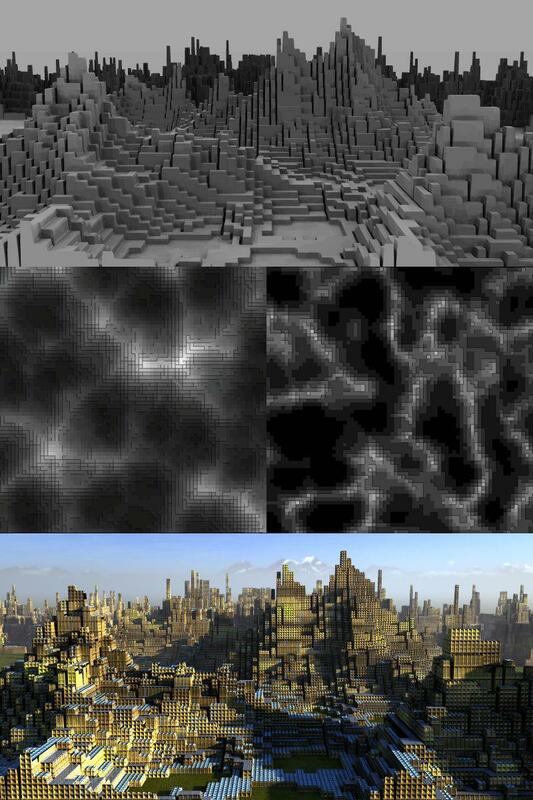 Nice terrain experiments from everyone. Here's another use for posterisation. It need refining but I can see good use for it. Ever so subtle and could do with being moreso, but the shallowest water here has lots of detailed ripples by creating a terrain, posterising it, smoothing it and then flattening it to almost nothing... Also using the red bracket, make the bottom layer invisible to make the edge unstraigt and it can just be placed on a flat plain to get a good effect of uneven water edge. 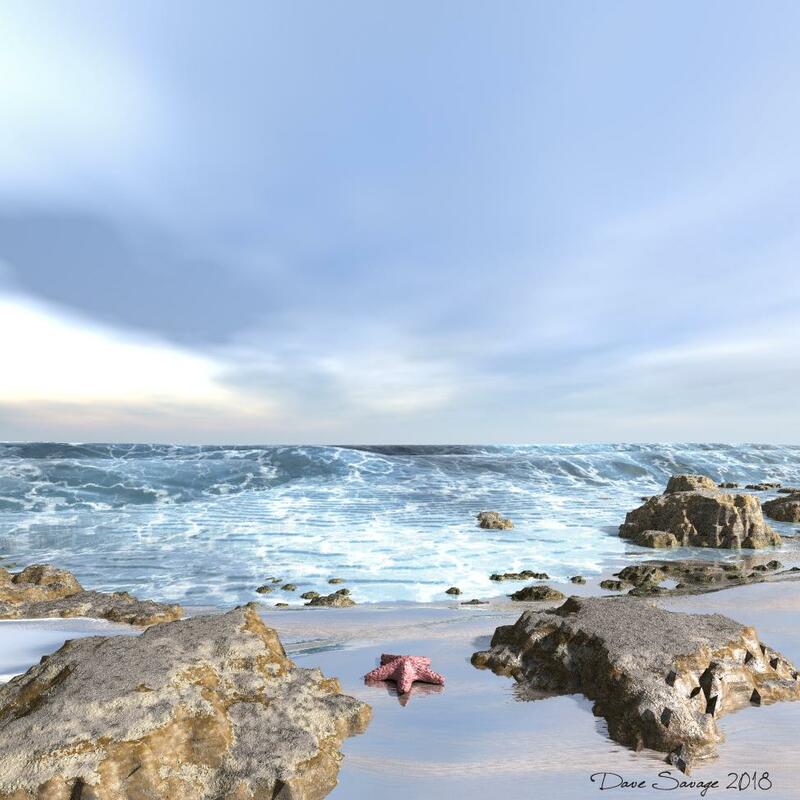 Wow!, love the beach scene! That would make a great print to hang on the wall! Dave - that came out very well - and the sky fits as well. Dave Savage - That came out really good; not easy to do I'm sure. 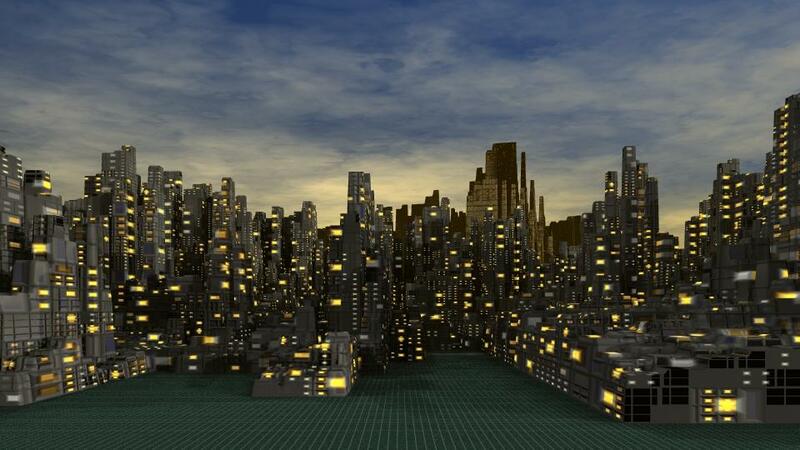 Slepalex: very nice city render. And fun spiral! Dave: This is a great idea. Looks quite nice to me. I show most my 'normal-like' terrains made with World Machine in the 'Show us your renders' thread. But this one is a strange mixture of a WM world, heavily modified in the ET. I used posterize, including 'Alt', some filter and some other options, including mounds. Out came this strange world. I would not be able to repeat it, because it was just playing, without noting down, what I actually did. The texture is a much higher frequency version of a texture by Jonathan Cummings. Dave, very good. Light, atmosphere, textures and materials. I made observations on the size of the waves in the next thread. But here it is necessary to increase the resolution of the terrain of the foreground to smooth out these black triangles. I also experimented with the TE today. Mixing two terrains is usually done in the Pictures tab. There is a different means with different results. Pull down the bracket to cover the part of your terrain you want to keep and create a new one, then open the bracket. The new terrain fills the space that was not yellow. It is a bit tricky. The first terrain is already in the left slot under Pictures. Copy it and paste it in the middle slot. If you mess up with the bracket and the second terrain, you can go to the Pictures tab, copy the second and paste it into the first and apply. Then you have the first back and can start anew. I first used Warped Ridges and added a bit of Posterize. Then I covered most of it with the bracket from top and created a Pocket terrain. The result is shown below and a test render. Note that this is a single terrain. Hansmar - I know what you mean but your terrain does look really good. The flat plateau looks like an old fort or ancient alien landing zone. Keep up the good work. Horo, I didn’t quite understand your intricate manipulations with brackets, but here’s what I did without brackets. I just created the Warped Ridges terrain, posterized it, copied it and pasted it in the 2nd slot on the Pictures tab. 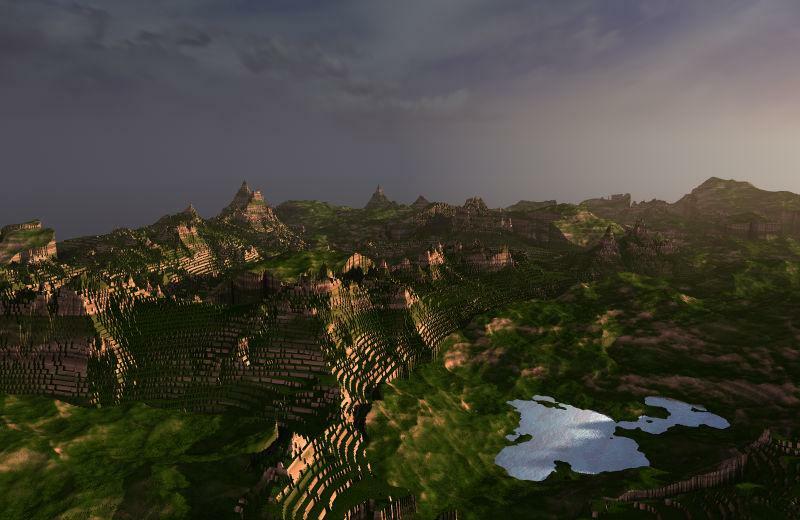 Then I again created a random Warped Ridges terrain, clicked on Apple and with a soft brush Unpaint Effect partially deleted the second terrain above the high (light) parts of the first posterized height map. That's what happened. Here is another terrain creation. This software is available on Steam: Qubicle Voxel Editor. 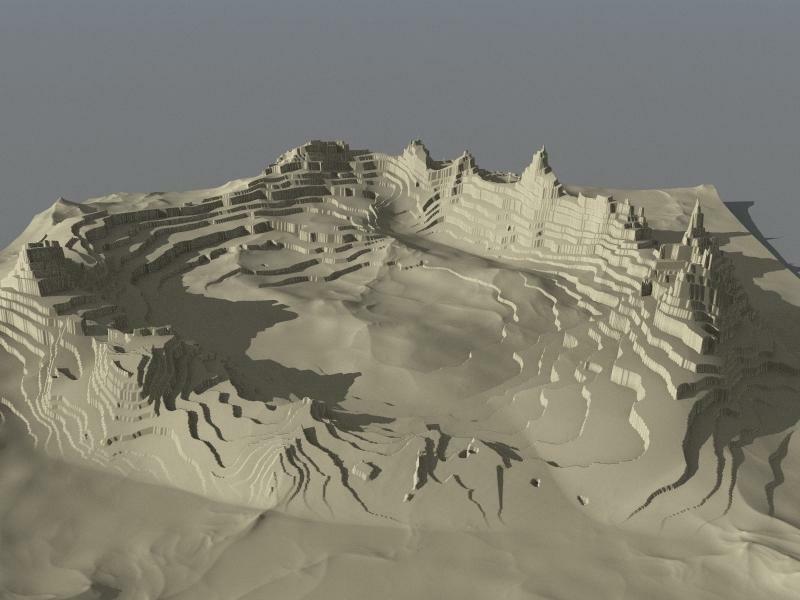 Of course the alt key trick is a game changer in the Bryce terrain editor-a lot quicker; however, I am having some fun with this and I wanted to share. I imported this from the voxel editor as an .obj file.. this isn't finished.. more like just playing around.. If I could get the coloring right, would look interesting as a voxelized piece of ice with the right lighting shining through it. I attached a pic of Qubicle. Eventually I want to create some type of syfi world with it. Slepalex - Just pull down the bracket. Everything that is not yellow will be filled with the new generated terrain. Then move the bracket up. Some manual corrections may be needed where the two terrains meet. Your method with unpainting is very clever. It can also be used with the above method to blend the terrains better. Rasberri - thank you, nice terrains from you.